Kermans Flooring in Indianapolis understands both sides of this challenge. Our in-house design staff - a free resource to all customers - is ready to meet the challenge. 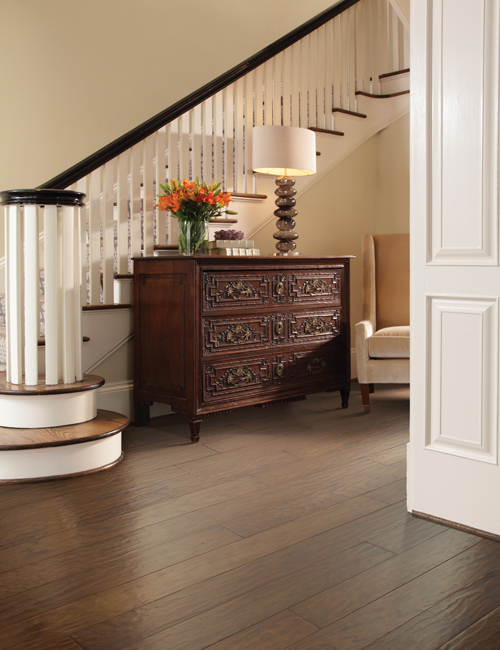 Read on for three tips to selecting flooring for your entire house. 1. It's okay to mix your flooring materials. Yes, wall-to-wall carpeting is an economical and popular choice for many homeowners. And for good reason with its comfortable feel and natural insulating qualities. Hardwood is another popular choice that works well throughout an entire house. Wood flooring is a timeless floor option and easy to maintain. There's no reason you can't have both - or even add in some tile and area rugs to the mix. Concerned that the hardwood hallway won't match up well with the tile kitchen and the carpeted great room? There are lots of ways to tie designs together and create beautiful transitions from one flooring type to the next. Let our design staff guide the way to mixing and matching different types of flooring. When your entire house is a blank slate, its best to choose the materials that work best with your sense of style. 2. Keep your lifestyle in mind. Chances are that some rooms in your house will see much more traffic than others. Certain floor types stand up best to wear and tear while others should be reserved for lower traffic zones. You don't want to put a soft, velvety carpet in the living room where your kids and pets will spend most of their time. Think about the traffic patterns of your house and look for flooring that can handle the volume - there are good, durable flooring options in all types of floors from carpet to hardwood. When selecting a floor you should also keep in mind the use of the room. Love to cook? You'll want a kitchen floor that stands up to traffic and is easy to clean. Plan on entertaining a lot in your basement? You'll want a floor that holds up well to the sometimes humid lower level environment and is comfortable for your guests. A little thought ahead of time will help direct you to the best options in the store. There are no rules to flooring. You don't have to have a tile kitchen floor. You don't have to have carpet in the bedrooms. When you are selecting flooring for an entire house, you should start with what you love and then take some practicality into consideration. This is where shopping at a full service flooring store like Kermans makes such a difference. You aren't limited to one type or brand of flooring at Kermans. In fact, we pride ourselves on carrying a wide variety of flooring for every lifestyle and every budget. We can take your dreams and make them a reality room-by-room. Whether you're moving into a fixer-upper, are building a new home or you've saved up and are ready for some serious upgrades - don't try to pick out flooring for your entire house on your own. No matter the reason, Indianapolis flooring store Kermans is your one-stop resource for floors for every room in the house.